With snow already accumulating on the slopes near Lake Tahoe and around Northern California, stoke is high for this winter’s ski season. If you are a skier or snowboarder and you haven’t made it to the mountains yet, you’ve probably been dreaming about shredding groomers at Heavenly, tree skiing at Kirkwood, or finding new lines in the backcountry. While it’s tempting to return year after year to your favorite runs, consider upping the adventure factor this season and ditching the lift lines—by planning a trip to a backcountry ski or snowshoe-in hut. Several organizations maintain cozy (or at least sheltered) cabins throughout the Sierra where you can rent a bunk and get away for an idyllic winter escape. Here, our picks for five snowbound destinations you won’t want to miss this winter. Deep in the Yosemite backcountry, historic Ostrander Ski Hut awaits intrepid skiers who are willing and able to make the trek. Built in 1941, when the prevailing theory was that backcountry would become more popular than resorts, the cabin feels like a charming relic of a bygone era. More than 10 miles of groomed road and trail separate the trailhead at the Badger Pass Ski Area from the hut, which sits beneath a glacial cirque on the edge of Ostrander Lake at 8,500 feet. While the trail can feel like a long haul for an overnight or even a weekend trip, the route boasts stunning views of Half Dome and the ranges beyond that will make you (temporarily) forget your fatigue. Maintained by the Yosemite Conservancy, Ostrander Ski Hut provides the basics, but expect to bring bedding, cooking gear and utensils, food, and water purification. If you are willing to make the drive south, a ski trip to Pear Lake Winter Hut is worth the effort. Tucked away in Sequoia and Kings Canyon National Park amid some of California’s most rugged terrain, Pear Lake is a true alpine experience. The trail to the hut is not recommended for beginners, as it traverses six miles and climbs 2,000 feet and can have dangerous avalanche conditions. But once you’re there, you have access to prime backcountry terrain, including scenic lake basins and craggy peaks. Like Ostrander, the hut has basic amenities and you will need to bring most of your own supplies. Located at the end of the famous Glacier Point Road, a ski trip to the Glacier Point Hut is an unforgettable way to experience Yosemite’s finest scenery in winter. The trail starts from the Badger Pass Ski Area and travels 10.5 miles of groomed road, making this a popular trip for cross country skiers. 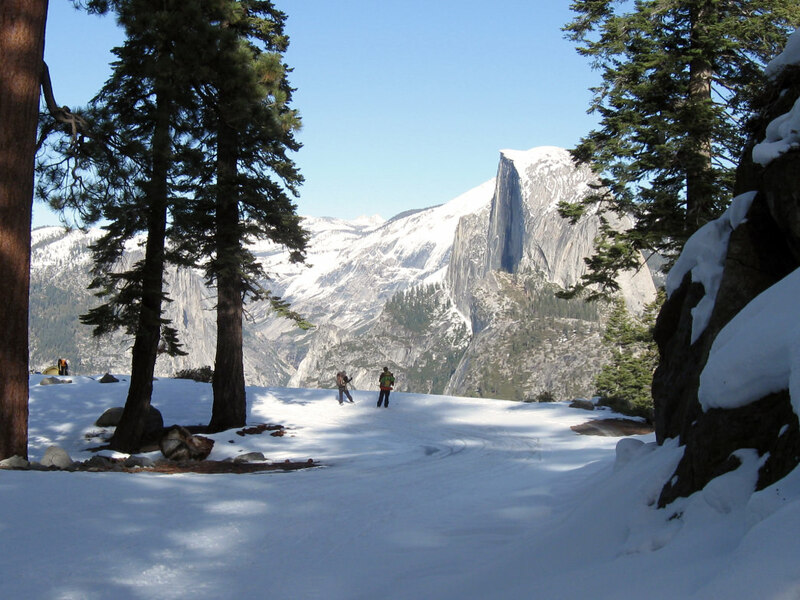 From the hut, you’ll have unobstructed views over snow-covered Yosemite Valley and Half Dome. If you are looking for a more upscale experience than other backcountry huts, put Glacier Point at the top of your list—you can leave the backpacking stove and other gear behind because meals are provided in the dining room. Near Donner Summit, the Sierra Club’s Peter Grubb Hut is a favorite backcountry destination in the Tahoe area. To access the hut, you’ll ski or snowshoe for about three miles and 800 feet of climbing along the Castle Peak trail. Once you reach the hut at the edge of Round Valley, expect sweeping views of Castle and Basin Peak and access to some of the best expert lines in the Tahoe area. Amenities at Peter Grubb Hut are basic, so expect to make the journey carrying most of your own supplies. Perched on the Sierra Crest at 8,350 feet, the trail to Benson Hut is exposed and avalanche prone. Experienced backcountry skiers can follow the Pacific Crest Trail as it climbs 1,800 feet over 5.5 miles from Donner Pass to reach the hut, located between Sugar Bowl and Squaw Valley at the foot of Anderson Peak. Expect the bare minimum of supplies and amenities—but maximum views over the Sierra to the north, east, and west. From the hut, skiers can access steep bowls, narrow chutes, and glades. Backcountry skiing is an inherently dangerous activity—no matter if you are taking a few turns or planning a multi-day excursion. Before you start your trip, be sure to read up on the route and snow conditions. Sierra Avalanche Center is a good source for conditions, and many of the huts also post conditions or contact information for a ranger. In addition to researching the conditions, you should be prepared to spend the night in the elements in the event that you don’t reach your destination. Many of the huts can only be accessed by traveling across terrain that may have avalanche danger, making adequate training and gear are a must for these routes. Know Before You Go has good introductory information about avalanche safety.